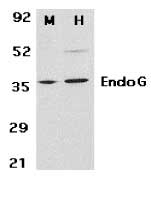 Rabbit anti endonuclease G antibody (AHP730) used for the evaluation of Endo G expression in rat mitochondria by western blotting. Release of mitochondrial intermembrane space proteins. Mitochondria were incubated as described in the legend of fig. 1, whereupon they were sedimented by centrifugation and proteins of the resulting pellets (P) and supernatants (S) were analyzed by immunoblotting. Panel A: release of cytochrome c, Smac/DIABLO, Omi/HtrA2, AIF, endonuclease G, and LACTB by histones, tBID and p53. The concentrations used were: 5 μM histone H1.2; 10 μM histone H2A, 10 μM histone H2B, 5 μM histone H3, 5 μM histone H4, 1 μM tBID, and 1 μM p53. Panel B: effect of cyclosporin A on the histone-induced release of cytochrome c and Smac/DIABLO. Panel C: accessibility of AIF and LACTB to trypsin hydrolysis in the presence of histones. Destabilization of the Outer and Inner Mitochondrial Membranes by Core and Linker Histones. Rabbit anti endonuclease G antibody (AHP730) used for the evaluation of EndoG expression in HCC1187 cells treated with TG02 in vitro by western blotting. (A) HCC1187 cells were treated with TG02 (1 μM) for different times (0, 6, 12 and 24 hours). Loss of mitochondrial membrane potential and viability were analyzed by flow cytometry after staining with TMRE or propidium iodide (PI), respectively. 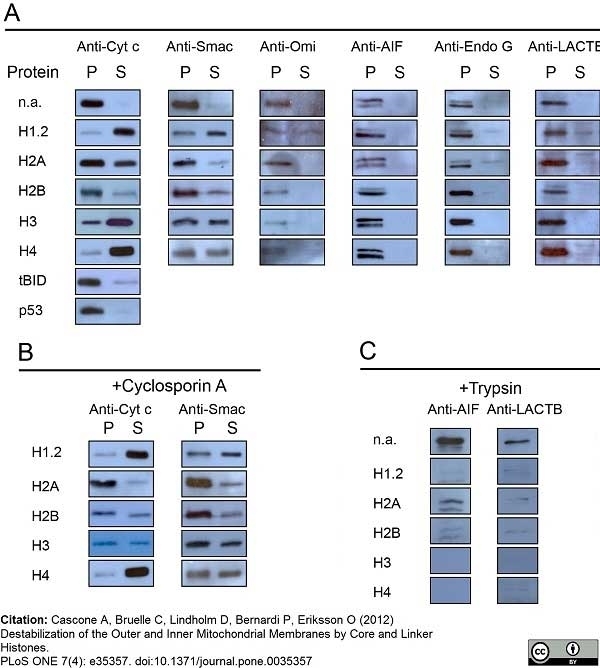 (B) Expression of proteins involved in apoptotic mechanisms was analyzed by Western blot after treatment of HCC1187 cells with TG02 (1 μM) at the indicated times. GAPDH was used as loading control. (C) Release of proteins from the intermembrane space of mitochondria in HCC1187 cells treated for 12 and 24 hours with TG02 (1 μM) was analyzed by Western blot after subcellular fractionation. COX IV and ERK1/2 were analyzed as mitochondrial and cytosolic markers, respectively. (D) Role of caspases in TG02-induced cell death. 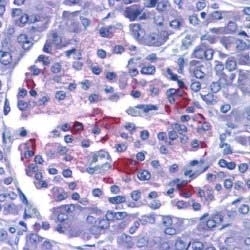 Induction of cell death by TG02 was analyzed in HCC1187 cells by flow cytometry after 1 hour of pretreatment with the pan-caspase inhibitor Z-VAD-FMK (25 μM), followed by treatment with TG02 (1 μM) for 24 hours. From: Ortiz-Ruiz MJ, Álvarez-Fernández S, Parrott T, Zaknoen S, Burrows FJ, Ocaña A, Pandiella A, Esparís-Ogando A. Therapeutic potential of ERK5 targeting in triple negative breast cancer. Rabbit anti Endonuclease G antibody recognizes human endonuclease G, also known as endoG. Endo G is a 297 amino acid, including a 48 amino acid transit peptide ~36 kDa mitochondrion-specific nuclease that translocates to the nucleus and cleaves chromatin DNA during apoptosis. EndoG is reported to act independently of caspases and may represent a caspase independent apoptotic pathway initiated from the mitochondria (Li et al. 2001). Antisera to endonuclease G were raised by repeated immunisations of rabbits with highly purified antigen. Purified IgG was prepared from whole serum by affinity chromatography. Synthetic peptide GGPRGPGELAKYGLP corresponding to amino acids 55 - 70 of endonuclease G.
AHP730 detects a band of approximately 35kDa in HepG2 and 3T3 cell lysates. Colado, E. et al. (2011) Zalypsis has in vitro activity in acute myeloid blasts and leukemic progenitor cells through the induction of a DNA damage response. Amoury, M. et al. (2016) A novel approach for targeted elimination of CSPG4-positive triple-negative breast cancer cells using a MAP tau-based fusion protein. Int J Cancer. 139 (4): 916-27. Maiso, P. et al. (2008) The insulin-like growth factor-I receptor inhibitor NVP-AEW541 provokes cell cycle arrest and apoptosis in multiple myeloma cells. Br J Haematol. 141 (4): 470-82. Cascone, A. et al. (2012) Destabilization of the outer and inner mitochondrial membranes by core and linker histones. PLoS One. 7 (4): e35357. Álvarez-Fernández S et al. (2013) Potent antimyeloma activity of a novel ERK5/CDK inhibitor. Clin Cancer Res. 19 (10): 2677-87. Ortiz-Ruiz, M.J. et al. (2014) Therapeutic potential of ERK5 targeting in triple negative breast cancer. Ocio, E.M. et al. (2009) Zalypsis: a novel marine-derived compound with potent antimyeloma activity that reveals high sensitivity of malignant plasma cells to DNA double-strand breaks. Li, L.Y. et al. 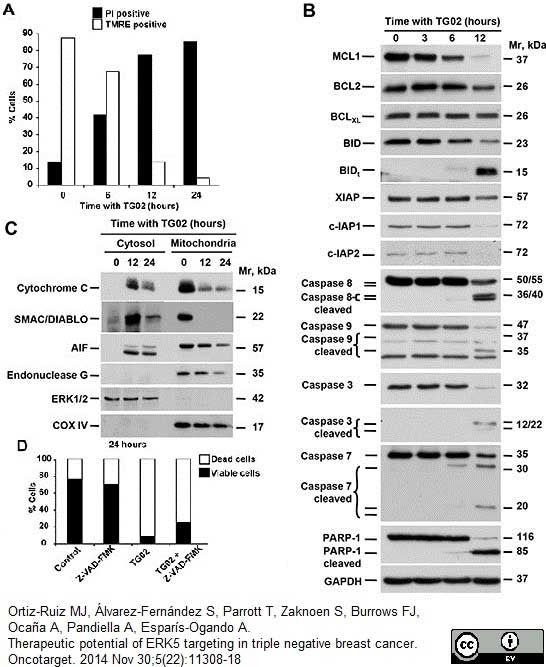 (2001) Endonuclease G is an apoptotic DNase when released from mitochondria.